The Activity Calendar has been updated and the list of local events providing photo opportunities added above. The ballot for workshops in June and October has now closed. the results will be posted in the Workshop bookings tab above by Monday. Thank you for your entries. If you did not enter the ballot but wish to be listed as a reserve for either event please email Lindsay using the link at the top of the page. If you wish to enter the ballot for workshops in June or October please click HERE. The ballot will close at 9am on Sunday 24th February. Here is a link to the first newsletter of 2019 jam-packed with information about activities interesting articles, reports and even items for sale. It shows what a busy group we are! Note: It should be possible to read the Facebook Group on a PC without an account. It's a New Year and a good moment to make some photography resolutions! To help we have the first of our regular Platform meetings, this coming Thursday (17th Jan) at 2.00pm, when Nick is not only talking about Street photography, but also sharing some of the images from the Rotary Club Young Photographer competition. The following Thursday, the 24th, is a field trip to the church at St Just in Roseland, an information sheet is available via this link. Thanks to Kathryn for the idea and initial research. December Newsletter (Edition 6) now available. Click on large Blue / Yellow "Latest Newsletter" button at top of page to read latest version. 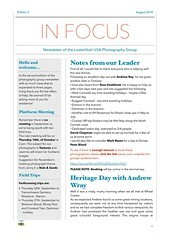 An archive of previous editions of the newsletter is available on the Photography Documents page of the website. The activity Calendar has also been updated. Again click on the large Blue / Yellow button at top of page to read latest version.